This book is a celebration of the Korean culture and heritage, more specifically of the Korean Lunar New Year. 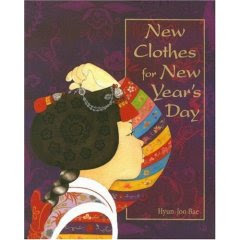 I could say that or I could just say - it is a book about a little girl playing dress-up, Korean dress-up. Take it as you wish, but its a cheery book that every little girl will savor! In her plain white underclothes stands the little girl looking out the window on a cold winter morning. But its the first cold winter morning of a New Year! And what brings the most joy to her little world is her new crimson silk skirt and her chance to bask in it. 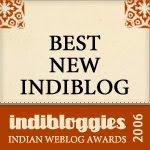 The narrator demonstrates how carefully and delicately she adorns herself. She puts on her skirt, her embroidered socks, her rainbow jacket, her delicate headgear and a long list of fine accessories. But the subtle yet strong nuances are what make it so wonderful - the pause to admire at every stage, the crusade to tie the perfect bow, the minor adjustments to make it look just right. More embellishments - new, textured, intricate, dazzling. Down to the finest detail, a charm for luck! Just as fresh snow makes a landing, the girl is all ready, so utterly perfect to set out to wish good luck to her near and dear. With a straightforward and very simple way to introduce Korean traditions to children, the book is laden with the inherent serenity that the far east emanates. Elegant, warm and colorful sketches seem to do justice to the girl's ulterior desire. The last two pages of the book are dedicated for factual content - a write up on traditional Korean (Lunar) New Year celebrations and the significance of new clothes for New Year's. Alongside is a diagram of the ensemble, head to toe. A sleepless night on the eve of a chance to wear a new attire is not uncommon in a child's world. This book neatly lays it out, drenched in an Asian flavor, while exhuming warmth and cheer. Don't chide me for your little boy's nonchalance for the book but it sure is a guaranteed delight for any girl, anywhere on the map!